Live from the Shabby Nest....It's Fruuuuuuuuuugal Friiiiiiiiiday! Welcome to this week's Frugal Friday! Lot's of great stuff last week...but before I get into my Frugal Round-up I wanted to thank all those who gave me your input on the white vs. gray sofa cover dilemma. I'm in agreement with you all that gray seems to be the way to go...not that I don't love the white, I do, but I was leaning toward the gray, and it was nice to have my feelings validated! Mwah! First up, Homeroad shared her simple and wonderful driftwood towel rack. This is frugal ingenuity at it's best! Next, Loving Life shared her pretty Craigslist table and chairs revamp. Love the fresh new look! 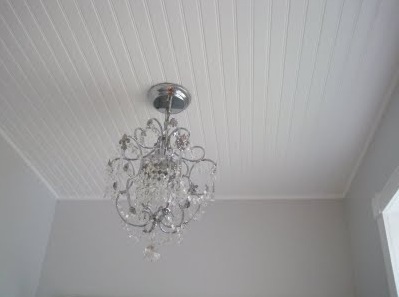 Addicted 2 Decorating shared her pretty, beachy gallery wall. Lovin' those walls too! Finally, Belle and Sparrow shared her gorgeous bath remodel. You know I'm lovin' that gray! Thanks for hosting! That beach wall is so pretty. I linked up a paper starburst and my painters tape cord control. That Beachy Wall Gallery is FABULOUS!!! Thanks for hosting this link party every week. So many great ideas! Thanks so much! 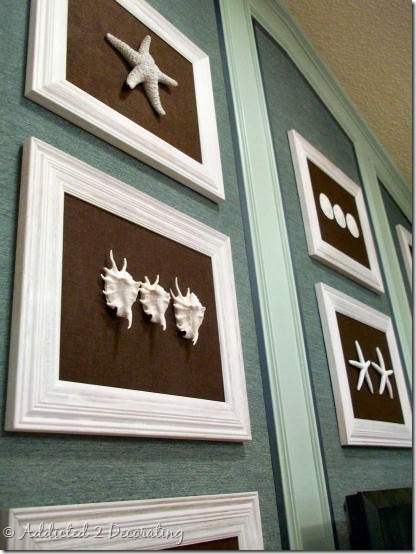 The beachy gallery wall is such a great idea...so pretty and elegant. Thanks for featuring my driftwood hooks Wendy! Thank you for hosting. I'm a follower. Thanks so much for hosting a weekly link party every Friday! I love stopping by to link up and check out some fabulous links!! Thanks and have a fabulous Friday! Thank you for hosting. Very sorry for the double post. The first time I was not directed to the photo screen. Happy Friday! I love all of the other features you have shared! That driftwood towel rack is genius! I saw driftwood at Michael's but passed it by...am rethinking that decision...going to Michael's today! ;) The gallery wall is AMAZING! The colors and textures are beautiful. And the table set is gorgeous, and I love the color she used! I will be going now to visit these blogs! P.S. If you like the gray color of paint I used, it was a custom color of Freckled Laundry's, which she shared. I will email the link to you just in case! Hello again. Thanks for hosting a wonderful party. I'm linking my faux snakeskin back splash. Check it out I'm # 337. Wow! and Wow again!! I could only dream of having even a portion of people link up to my own Frugal Friday's lnky....I'm working on it. I clicked over here from someone else's blog and it looks like I'm going to be plenty busy today check out posts!! I'm putting my own linky post. I am loving that driftwood towel rack! it would be the perfect thing to go with my beach themed master bathroom. So much inspiration here! Thanks for hosting! I love all those! I need a rack of hooks and the driftwood would be perfect, along with the beachy gallery! Love the blue table and bath re-do. Thanks for hosting! Thank you for hosting, and for featuring my gallery wall!! Thanks so much for hosting yet another FUN party!! Great job I love your blog!